Our personal portfolio sites are an excellent way for recent graduates and job seekers to separate themselves from the pack. Here we have a one-page design in Divi from Elegant Themes. The page packs a lot of information into a well-segmented, easy to digest format. The CV is tabbed. The slideshow presents highlights of coursework from his major. Then there’s a nice list of professional and personal projects with links to code on GitHub. 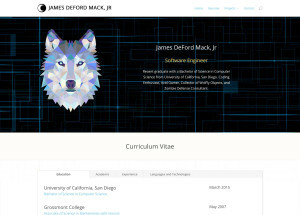 James said that his website was a key conversation piece throughout the process of interviewing for and landing a job in software engineering. And really, what better way to present an extended CV and slideshow of projects worked on?